There are many eye conditions that affect people in the UK. There are many eye conditions that affect people in the UK. Whilst some are very rare the most common eye conditions are Age Related Macular Degeneration, Glaucoma, Diabetic Retinopathy and Cataracts (use anchor text links here). Here’s an overview on these conditions, and links to other organisations where you can find out more details. We’ve also a section for you if you’ve suffered sight loss following a stroke or are experiencing visual hallucinations. Macular Degeneration can affect people of all ages, but it is the leading cause of sight loss in people over 60. Macular Degeneration causes problems with the central vision, which can become distorted or blurry. This means that someone with this condition might look at you sideways and may be unable to see fine detail. Over time, it can lead to a completely blank patch in the central vision although people tend to retain some peripheral (side) vision. The development of this condition is significantly affected by diet and smoking. 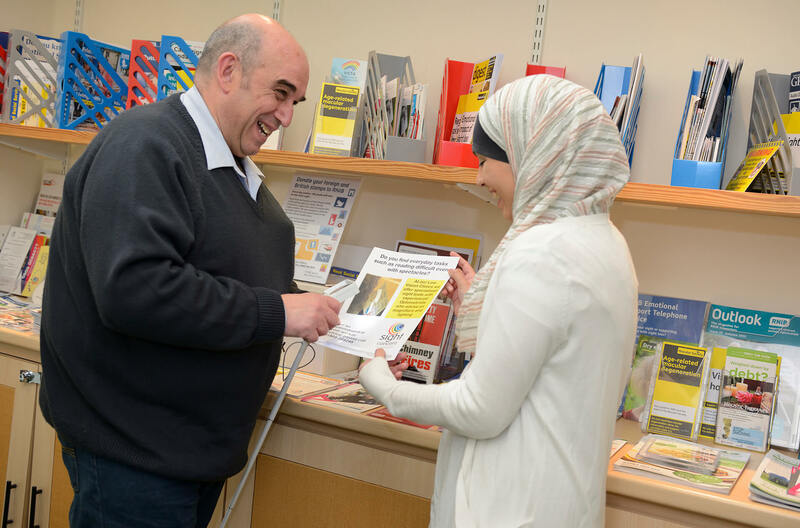 You can find out more on the Macular Society website or visit the NHS information website and look up Macular Degeneration. Glaucoma is a hereditary condition which can cause blindness if it is not managed with daily drops. It causes optic nerve damage due to changes in the pressure in the eye and can lead to loss of peripheral (side) vision which means that people with this condition may not see things or people that are approaching from the side. People who are developing glaucoma are often unaware that there is anything wrong but it can be detected by special tests that are used every time we have an eye examination at the opticians. People over 40 who have a close family member with glaucoma are entitled to a free eye test on an annual basis to ensure that any glaucoma is identified as quickly as possible. The International Glaucoma Association has more information on this condition. There is more information on the NHS information website, look up glaucoma. Diabetes affects all the major organs of the body including the eyes. Diabetic Retinopathy causes the central vision to become patchy and it can be difficult to read and drive. 40% of people with Type 1 Diabetes and 20% of those with Type 2 Diabetes will develop some type of Diabetic Retinopathy. It is the biggest cause of sight loss in the under 60s in the UK. People who maintain a healthy weight, control their blood sugar and stop smoking will reduce their chances of developing Type 2 Diabetes and therefore reduce the likelihood of experiencing sight loss as well. Cataracts are a very common eye condition, mostly caused by the ageing process of the lens inside our eyes. As we get older, the lens inside our eye gradually changes and becomes less transparent. A lens that has turned misty may have a cataract. Over time a cataract may get worse, gradually making objects appear cloudy or misty. Cataracts develop slowly and can lead to blurred vision, change in colour vision and sensitivity to glare. The treatment for cataracts is a simple operation, normally under local anaesthetic and performed as a day-case procedure. During the operation the natural cloudy lens is removed and a plastic one inserted. Maintaining a healthy diet, wearing sunglasses and stopping smoking can reduce some people’s chances of developing cataracts. There is more information on the NHS website, look up ‘cataracts’. For more information click on this link to the Stroke Association or the NHS website and look up ‘stroke’. Retinitis Pigmentosa (RP) is the name given to a group of genetically inherited eye conditions that affect the retina at the back of the eye. RP causes permanent changes to eye sight, but how much vision is affected and how quickly the changes take place varies enormously from person to person. For people with RP, faulty genes cause the cells in the retina to stop working and eventually die. This affects the eye’s ability to process light, so that people with RP are often sensitive to light and may find bright light, changes in light levels and seeing in dull conditions such as outside at night or in dimply lit rooms difficult, this is often called night blindness. Many people with RP also loose peripheral vision which means seeing things straight ahead is easier but seeing things to the side is more difficult.